Members of the Accounting & Financial Women's Alliance (formerly American Society of Women Accountants) share their reasons for being a member and what they have gained from membership in our organization. Many of our members join to earn CPE on various technical and professional development topics, create a network of professional contacts and develop their own leadership skills. Our members stay for the friendship and fun! Dorothy Ashley - I got started in AFWA while at ASU in 1981, joined the Phoenix Chapter and later chartered the Mesa East Valley Chapter. 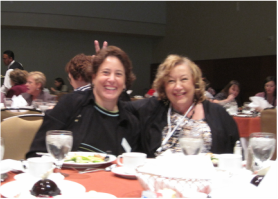 The most rewarding part of being a member of AFWA is the friendship of our members. I'm proud to be an AFWA member because it is a great place to meet fellow accountants and improve in our field by attending seminars. AFWA has helped me be more able to speak out at meetings, be more confident and outgoing. If it weren't for AFWA I would not be full filled, would not be a complete person. I would have missed so much of what life can bring. 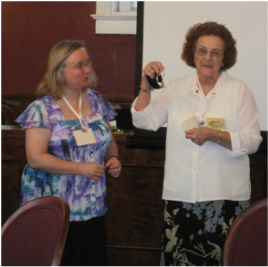 Anna presented Dorothy with a special recognition in 2011 for 25 years of perfect attendance at Mesa East Valley Chapter meetings! Anna Von Straussenburg - I got started in AFWA when a co-worker invited me to a meeting. When I went to leave my car wouldn't start. A member waited with me for the tow truck. Six months later she became my employer. The most rewarding part of being a member of AFWA is meeting all the wonderful women in this organization. I am proud to be an AFWA member because AFWA is all about improving ourselves. My AFWA ah-ha moment was when networking got me a job. AFWA has helped me improve public speaking and make new friends. If it weren't for AFWA I wouldn't have has as much success in my career. Deborah Wheeler - I got started with AFWA in 2012. The most rewarding part of being a member of AFWA is fellowship and networking. I'm proud to be an AFWA member because the women in this group are so awesome. My AFWA ah-ha moment was becoming secretary at the installation. Brenda Masters - I got started in AFWA when I was unemployed. The most rewarding part of being a member of AFWA is the networking and sharing. I'm proud to be an AFWA member because women should be recognized. Kathleen Pease - I got started in AFWA in September 2012. The most rewarding part of being a member of AFWA is volunteering at the food bank. I'm proud to be an AFWA member because we help the community. AFWA has helped me become a teacher for a local college. Ila Sowing-Dunmire - I got started with AFWA when I graduated from DeVry. The most rewarding part of being a member of AFWA is the members and guests I have met and will meet. AFWA has helped me get the support I need to hang in there. Deanna Shantel - I got started in AFWA when I found the group online and joined sight unseen. The most rewarding part of being a member of AFWA is the relationships and comradery. I'm proud to be an AFWA member because I am a member of a fabulous group of women who have come together professionally and stayed for friendship. My AFWA ah-ha moment was when I volunteered for career/job bank and it landed me a job. AFWA has helped me engage with the professional community in a personal way. If it weren't for AFWA no one would understand my jokes. Joyanna Hammond - One the top priorities in my life has been the issue of equal pay for equal work. Starting in 1970, I became very aware through personal experience that women can do accounting (typically in the 40’s, 50’s a man’s realm) as proficiently as a man but we cannot draw the same pay. Employer’s in the 70’s and 80’s openly discriminated against women on this issue. In 1979 Betsy Scott took me to an ASWA meeting in Kansas City. From the first night there was a comradery there beginning in the same profession and all women (although occasionally a man would sneak in). Although I was an active member of Business and Professional Women and Toastmaster (formerly Toastmistress), there was something different about ASWA. It was more what I envisioned of a sorority (not that we had any secret codes or handshakes) but a connectivity through the profession. As the years progressed, these “sisters” were a mainstay in an ever moving career and in location. In the Phoenix Chapter, I meant Jo Sylvanus who became an auditor on one of my favorite jobs. When and where ever we meet now there is an instant renewing of that friendship. And as for Betsy Scott, she was my mentor and forever a friend, and was National President and Foundation go getter. Being single for so many years, there were times I could not afford the dues and had to discontinue my membership for a while. When I rejoined, some of the old faces were still there and welcomed me back but most importantly there were new women (like Paula Zanni) wanting to network and further their education. This was another reason AFWA is important to me. Even though I did not need the CPE’s until I got Certified as a Professional Bookkeeper, that I really actually enjoyed learning about tax updates, excel formatting, health insurance accounting treatments, etc. Most programs I did and do get some bit of information that I can apply to my work or personal life. I got some beautiful jewelry and stuff for my house from some of our meetings too! So since 1979 to today AFWA, although there has only been a small headway in the equal pay issue, my path has been blessed with many women who strive professionally with my same desires and I would like to thank each one of them for the time spent with me as we travel the accounting highway towards that ultimate end…. Equal pay for equal work. Members share their reasons for being members during the 2011 Annual Conference.